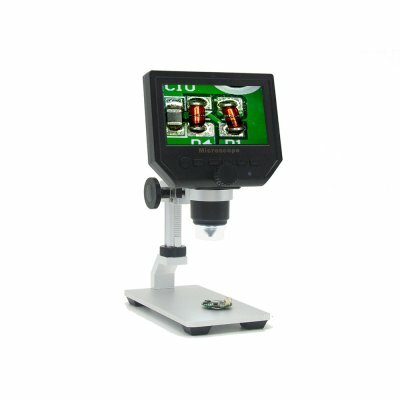 Successfully Added Digital Microscope - 600x Zoom, 4.3-Inch HD Display, Built-In Battery, HD Video Recording, Timestamp, Motion Detection to your Shopping Cart. With this HD digital microscope, you will be able to see and explore the world like never before. Featuring a 600x zoom, this magnificent device is capable of clearly displaying the smallest of details in amazingly sharp resolution. Featuring a compact design, this HD digital microscope is very portable and can be easily carried around in your bag – making it perfect for students and scientists alike that need to be able to carry along their tools. Thanks to its silicone suction cap, this HD microscope can be easily attached on nearly any surface - allowing you to work steadily not only in the lab but also outside or on the go. With its powerful battery, this video microscope offers up to 6 hours of continuous usage time which is enough to get through a day packed with research and tests without needing to worry about running out of juice. Along with its HD 720p camera, this video microscope features a sophisticated 4.3-Inch LCD display that portraits all that’s being observed in extremely sharp and detailed HD resolution – allowing you to in-depth analyze the smallest of objects. Besides recording high-quality footage, this microscope is also able to shoot sharp and detailed images in stunning resolution – allowing you to watch back your observations later on at a larger screen or, alternatively, to print them on photo paper. Simply slip in your 64GB SD-card and this digital HD microscope will be able to hold plenty of your latest recordings and images alike. Additionally, it allows you to insert a timestamp into your pictures and video – allowing you to easily watch back and analyze your observations of previous tests without mixing up the time and dates. Thanks to its unique design that features a variant stand, the base and display of this microscope can be twisted in any direction – allowing you to observe your objects from any imaginable angle. Its adjustable built-in backlight furthermore assures that you’ll always have the perfect lighting condition to obtain the optimal results out of each and every test conducted. This high-speed HD digital microscope truly is a multifunctional research tool that can be used at nearly any occasion. Perfect for educational purposes, industrial work, research, biology, and even mineral research and gemology – this HD digital microscope is sure to meet the demands of anybody out there. With this tool at your side you will be able to see the world from a totally different perspective, allowing you to conduct highly accurate research or to simply analyze objects from up close out of curiosity at any time of the day. This HD digital microscope comes with a 12 months warranty, brought to you by the leader in electronic devices as well as wholesale electronic gadgets..
Arabic: - مجهر رقمي - Chinese Simplified: - 数码显微镜 - Czech: - Digitální mikroskop - Dutch: - Digitale Microscoop - French: - Microscope numérique - German: - Digital-Mikroskop - Hebrew: - מיקרוסקופ דיגיטלי - Hindi: - डिजिटल माइक्रोस्कोप - Hungarian: - Digitális mikroszkóp - Italian: - Microscopio digitale - Japanese: - デジタル顕微鏡 - Korean: - 디지털 현미경 - Malay: - Mikroskop digital - Norwegian Bokmål: - Digital Microscope - Romanian: - Microscop Digital - Russian: - Цифровой микроскоп - Spanish: - Microscopio digital - Thai: - ไมโครสโคปแบบดิจิตอล - Turkish: - Dijital mikroskop - Vietnamese: - Kính hiển vi kỹ thuật số.